Perhaps even more controversial on Kickstarter than exclusive content are early bird pledge levels. As you can see on the example from Viticulture on the right, an early-bird reward is a limited pledge level that is strictly better (usually in terms of price) than a comparable level. Forward momentum is incredibly important when you’re running a Kickstarter campaign, particularly on the first few days. However, I think many project creators (myself included) assume that early bird pledge levels are the best way to get the project off the ground at the beginning. Now, I’ll agree that early-bird rewards are compelling, especially for first-time creators. Most likely you don’t have much of an established audience, so any attention you do get the first few days can be translated into pledges if you have an urgent reason for them to back now instead of later. So let’s just be clear about that: The sole purpose of early-bird pledge levels is to give potential backers a reason to pledge now instead of later on the first few days of a creator’s first Kickstarter project. Other limited reward levels: Give backers a chance to be a part of your product. Early bird reward levels don’t increase engagement, involvement, or loyalty, but other limited reward levels do. If you price them correctly, they’re more compelling than early-bird levels (see here for more info). Great product on a great project page: You know what’s more compelling than a gimmick like an early bird level at getting backer support? Create a great product and display it on a great project page. If you make something that people get excited about from day one, they’re not going to hit the “remind me” button. They’re going to back it right away so they won’t miss out on something amazing. Offer a fair price: It’s not complicated. Offer a fair price for your product and you eliminate the need for hijacking backers at an early bird price. Friends and family: For a first-time project creator, friends and family can be an incredible asset over the first few days. Spend the first 2 days of your project writing individual emails to everyone you know. You can read more about my philosophy on how to do this on this Kickstarter Lesson. Just in case you can’t tell, I do not support the use of early-bird pledge levels for non-first-timer project creators. If you have an established audience, there is no reason that you need a gimmick like that to draw in backers (unless you wronged your previous backers somehow, in which case you have a bigger problem to address). Instead, use methods 1 -3 above to compel your previous backers to support your new project early on. There are a few very specific downsides to early bird pledge levels. I experienced all of them firsthand through Viticulture, and those I chose not to repeat them with Euphoria (with Euphoria, I calculated what my early bird price would have been and just made that the unlimited base reward level for everyone). You create winners and losers: On your Kickstarter project, you want everyone to feel like a winner. You do that by making something awesome, offering reasonably priced pledge levels, and running an engaging campaign. You don’t want any backers to feel like they “lost.” But that’s exactly what early bird pledge levels do. 100 people might “win” the better price, but you’ve created a situation where everyone else feels like they lost. It might just be a little twinge–“aw shucks, I wish I had known about the project on the first day”–but you don’t want any backer to feel that way. Some backers are so turned off even just by the idea that you have an early bird level that they won’t back your project (that’s a bit extreme, but it’s more common than you might expect). You create confusion later in the project: Say you have a $25 early bird level for your gourmet marshmallow project, with a standard reward level price of $30. Two weeks into the project you add a pledge level based on backer feedback for $35 that upgrades the standard marshmallows to chocolate-dipped marshmallows…but you know that you can only make 100 of those marshmallows based on the production process. It’s easy to add a new reward level limited to 100 people, and just as easy for your standard level backers to upgrade to that level. But what about the early bird backers? They’re the ones who were there from the beginning–they formed the foundation of your project. Now you’re telling them that the only way they can get the special chocolate-dipped marshmallows is to spend what everyone else has to spend? You can’t just let them add on $5 because of your production limitations. So now even the early-bird backers feel like they lost. There is a very good chance that you will add pledge levels during the project–this example provides just a tiny taste of the conundrums you will create by starting out with an early-bird pledge level. Cancellations are quite visible: I’ve talked about cancellations before (see here). Even the best project in the world will have cancellations. Imagine how people’s impressions of your project would change over time if all backers got an e-mail notification every time someone cancelled. Not good, right? Well, in a way that’s what early bird cancellations do. It’s incredibly visible when some cancels from an early bird level, and it doesn’t inspire confidence in your existing backers. It’s also not good for new backers. Have you ever stumbled upon a project on Day 20 and seen a few unfilled early bird slots? It suddenly makes you wonder if there’s something wrong with the project that you overlooked the first time. You dilute your brand when you open up more early bird pledge levels: I’ll admit it–recently I grabbed the last early bird reward level for a Kickstarter project, and it felt good. Yay me for saving $8. I felt like one of the “winners” I described in #1. Then, two days later, I got an update from the project creator saying that due to the “unexpected success” of the early bird level, he was going to add a new early bird level, splitting the difference between the original level and the standard level. I’ve even seen project creators do this at the exact same price. A little part of my Kickstarter soul dies every time a project creator does this. Instead of manipulating backers in this way, just offer all backers a fair and reasonable price from the start. single early bird: This is the standard version of the early-bird pledge level. Set the limit at a certain number of backers, and when all slots are filled, new backers get the same thing at a slightly higher price. This might apply to more than one pledge level–several of your unlimited rewards might be paired with early bird specials. Just make sure that the difference in price between the early bird and the standard levels is minimal–no more than $5. tiered early bird: Offer multiple early bird tiers all in a row. For example, if your standard unlimited price is $50, you might have an early bird for 50 backers at $35, 100 backers at $40, and 150 backers at $45. The big problem with this level is that you often end up with a huge price difference between the lowest early bird and the standard price, which is offputting for many people. timed early bird: Rather than base an early bird level on a certain number of backers, base it on a certain amount of time. You can close reward levels at any time, so you might tell backers that the early bird level is open for the first 48 hours of the project. early bird until you fund: Alert reader Robin L. spotted this method on the Snowdonia project (I reached out to Travis at Indie Boards and Cards to see how he thought it worked for him, but I haven’t heard back). You can see how it worked on the image to the right. The early bird level was open until the project funded, and then Travis closed it and opened a slightly higher level. What do you think? Please share your perspective on early-bird pledge levels on the poll below and in the comments. I’m the type who will not pledge to a project if I miss the early bird. It depends on the project, of course. A good early bird will convince me if I’m on the fence, but I’ll back a project I love regardless. I love the Snowdonia solution. It’s very satisfying to feel like your pledge is appreciated, the discount is most compelling to me in that regard. Sure, I get the “Aw shucks…” if I miss out on an Early Bird Level for a project I really like, but what it DOES do is make me pay a LOT closer attention to the project. Every time there is an update I get to the Kickstarter page as quickly as possible to see if the update might cause cancellations from the early bird pledge (rare) or perhaps the update offered a new twist that would cause early bird pledgers to abandon that pledge level for the upgraded level! … then I can swoop in and take one of the recently opened spots! Even if I don’t end up getting one, it doesn’t bum me out that much, but the constantly scanning for an opening adds another level of interest for me. Justin–That’s an interesting perspective that missed early birds actually make you check back on the project more often. I hadn’t thought of that. Sorry to be 5 years later to the conversation, maybe you’ll never see this. But! Here is my “solution” to early bird, which I agree everyone should be early bird in a KS campaign. So, I think a little perk like this is nice, but I think using the term “early bird” is just going to confuse backers. I generally dislike them, as it makes me feel like I’m being punished for pledging if I don’t get one. I do like the idea of the Snowdonia solution though. I feel that kind of an early bird is just a thank you to those who did the heavy lifting and sharing with friends that makes the whole thing possible. I also agree that early bird rewards of a few dollars discount until the project funds is the most palatable of the early bird options… but I wonder does it really give the intended momentum in the first few days? Depends on a range of variables I guess. Will a cheaper price till funding is achieved also cause a sharp drop in post fund point backing? I guess perhaps not, because unlike the very limited early birds you really should have quite a few days to back a game before it funds and if you sit on the fence then are less likely to blame the creator than yourself. Well that’s how I’d likely think anyway. That looks good in pixels. I try to avoid ks with early birds. I feel like the author is making us a favor for a reduced price….but if you look closely it is backers that are helping this project kick. Also, the whole KS is an early bird, right? people will afterwards be able to buy your game in any case….and If you can do with 3$ less per copy, why not do this for all backers? I do not like early bird price levels, I tend to find out about a product some time after it is announced. But having the early bird already sold out shows I did not have good enough connections to get in on the “ground floor”. The producer was obviously willing to sell at the early bird price, but now he is not willing, because I found out about it a day later? It is similar to not being in on the initial price of an IPO, it just makes you feel like an outsider. So I find it actually provides an additional hurdle for me to cross, do I really really want the game, even tho I am paying top dollar simply because I did not know about it a day before others did? Well said, Don. That’s one of my biggest concerns about early birds. I still think a good alternative to the early bird level being a price cut is to include an add-on for free. This way, they get a bonus, more for their money, but later backers shouldn’t feel like they lost out on as much because not everyone will want the add-on and they’ll pay the same for the item as early birds. Sarah–Just to clarify, your suggestion is to have an early-bird level that is priced the same as the standard level, but it includes something extra for free? Can you share an example of where you’ve seen that work effectively? Also the game “Color Wars” had some limited slots which included their previous game without costing more. Lugus–Interesting. I like the incentivized sharing concept (although if people love your project, they’ll probably share it anyway). I’m not as big of a fan of the included prototype of another game, as I like to keep the focus on the current project. But I applaud that project creator for trying something new! I know this post is a few months old, but figures I would add that Flash Point: fire Rescue Extreme Danger did this. Backers who pledged in the first 2 days of the 30 day campaign got “realistic victims” included for free, later backers could add $3. I didn’t make the early-bird special, and added $3 with little hesitation. There was however a LOT of backer comments/confusion about figuring out if they qualified, if they could change reward tiers and still get the early bird special, etc. I am sure it was at least a mild logistical headache to work out all the different combinations of rewards that campaign offered, but my somewhat-complicated order all came through just fine. These are all good reasons why I don’t like early birds. :) Thanks for your comment, Becky! I know of at least a few times I’ve passed on a project because I missed an early bird slot. Most of the time I don’t mind missing it if we are only talking a couple of dollars. $45 instead of $42 is fine. But some projects had an EB level for $20 cheaper than the standard level. I see that as if I’m paying $20 more than I should be, which is unacceptable. At that case, they’ve already set the market price for their product at the lower level, and want me to pay a lot more. Not going to happen. I’ll just wait and buy it online later. BoardGameQuest: That’s a great point. I went back and added that in the “Early Bird Options” section. That gap can get particularly large if you have tiered early bird levels. If I see a project which I am “unsure of”, and it has an Early Bird pledge level, I’m temted to pledge, just to grab it. If later on, then campaign adds a review, and I don’t like the game, I can always cancel my pledge. No loss, and someone “later to the game”, can grab my EB. On the other hand, if the project gets a good review, well then I’m in already. One of the other problems of EB’s, is that Kickstarter has become very much a global funding system, and there in lies a whole other issue. If you launch your project, with EB pledge levels at 6pm Standard Eastern Time, well that’ll suit many US pledgers, but you can almost guarantee, that somewhere around the world, someone who wanted in on your project, will miss out, due to time zones. (Another reason to favour timed EBs, over limited). I want $1000 to fund a project, and I am offering a $20 pledge level. I could have 100 EB pledge levels at $15- yeah If they go, I’m $1500 so funded plus $500. 100 Happy backers… everyone else at the $20 will always be a little resentful to the 100 EB, and feel left out (as you mention above). So, if I state that the pledge level WOULD be $20, but ALL backers can get in at $15, with NO EB pledge levels, a) wouldn’t every customer feel special, and b) wouldn’t there be a temptation for MORE people to pledge at a lower price point. (Think of the success of “cheap entry point” Kickstarters, like Dungeon Roll). If the project is good enough, and the “decision point” for many poeple is price, then surely a low entry point for everyone is going to end up getting you more business in the long run, than a higher price point, that may push people away. If a project HAS to have an Early Bird, I really like the Indie Board and Cards approach, it gives the impression that: funding this project is the most important thing. The purpose of early bird pledge levels is to get momentum during the beginning of a project – but I’m not sure they are the most effective means of doing so. You can offer other incentives for backing early, ones that benefit all project backers. For example “If we hit X amount by day 3 the first stretch goal will be included in the game and other stretch goals will be reduced accordingly”. I think a neat approach for a project would be to have a “bonus list” of all the goodies you would like to add to the game and then an unrelated set of goals (stretch funding amounts, social media follows/shares, and quick start goals like my example above). Every time you hit one of the goals (regardless of type) you unlock the next bonus on the list. This makes me remember the Byzantio/Nekken campaign. The early bird was timed, but they weren’t ready for the demand and took a couple decisions that, in my opinion, damaged the image of the company. If you came late to the party had to pledge at the 48$ instead of the 38$ previously asked for US/EU backers (The early bird pricing was 34$ with worldwide shipping included). I had backed their first campaign (Gear&Piston) that had a great price, but this put me off pledging their second game. One other kind of ‘early bird’ level that I’ve seen that was very interesting way of doing it was to have a first-in first-out system. I can’t recall the project off the top of my head, but there were 2 early bird level, with the promise being to ship the early bird levels first, followed by the next level and so on. The difference isn’t a massive one, but I think it does create a bit of a winning feeling in those that benefit without creating hard feelings for those that don’t. With some projects, it can mean getting a product in your hands about a week or more earlier than others and even create excitement in the later backers once they start hearing about other people getting their product on the internet. I’m not sure how effective it was, but I thought it was a very clever and innovative way of handling the issue. Val–I thought about mentioning that, and it might work for some creators who mail projects by hand. However, if you use a fulfillment service like I do, it doesn’t feel right to intentionally hold back games once they’ve arrived. Also, it’s really tough to get the timing right if you use international fulfillment centers. The US games might arrive on June 1 and the European games land in Germany on June 8, but there might be backers in both areas who pledged to the “first-in first-out” pledge level. So do you hold the US games until the European games arrive? i couldn’t see myself ever doing that. I want all of my backers to get their games as soon as possible. I wanted to reward to those backers that expressed early interest in my project and supported me as an unknown designer. I wanted to reward to those backers that helped to provide early momentum for my project. I wanted to reward to those backers that were likely helping to promote my project and provide further momentum toward the funding goal. 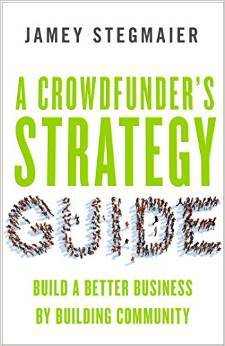 The spirit of Kickstarter has changed from the early days and it has become extremely competitive. I felt like a little fish in a big pond with salt water sharks circling everywhere and I needed some backup. My heart was in the right place… yet, there are definitely lessons to be learned in regards to early bird rewards. Tom–Absolutely, I can tell your heart was in the right place. I don’t mean to completely deride early bird levels. I think it’s a legitimate technique to employ for a first-time creator, just as I did. But I want people to know about the unintended consequences of early bird levels so that it’s a choice for first-time creators, not a default. Hi guys, new to the blog, it´s quite interesting. We are about to launch a Kickstarter project and i´m very interested on this early bird backer. We have 5 stretch goals for our game. Goal 1 ($24,000) is single stage and goal 3 ($80,000) is a RPG version. What about making a Early …..(help me with the name) to reach the 3 goal, after done, it stops. This way, it wouldn’t be a so short opportunity and backers will have much more time to find it. I would love to know your thoughts. H–That sounds like a version of option #4, which people seemed to respond positively to. I think it could be effective. Don’t know if your aware of what’s going on with this Shadows of Brimstone kickstarter right now, but they have EB pledge levels that literally increase by $150 for the exact same thing! The pledge is an all inclusive pledge and their justification for this is that as more things are added, the costs have to go up to pay for the add ons, yet people who paid $150 less than those backing now get the exact same things. On principle, I would never back this project because due to their own explanation, backers are quite literally paying for other people’s games. I normally don’t like spreading bad words around BGG or anything, but in this case, I wanted to thank you for never doing anything like this. I wish KS would make people read your blog before creating a project. Those discrepancies have not created a sense of community like you talked about, and I agree they are necessary for a good project. Kolby–What the what? That’s ridiculous. You’re right–they’re literally having backers pay for other people’s games. That’s the opposite of building community. Yes, and it’s a pity because their game looks really godd and they offer tons of free strech goals in addition to optionnal add-ons. But as you point out, people missing the early birds always feel bad about it, of course it’s perfectly ok when they only pay 10% more, but here the gap is from 325$ to 475$ ! and that created a huge backfire on the comment section. They tried to fix the issue by offering up to 75$ of add-ons to the 475$ level (75$ is the price of the base box for the game) but as you say it considerably damaged backers feeling about the game, which is a very bad thing. They should have done it the way Cthulu Wars did it: they created the ‘get it all’ pledge level near the end of the project, with a not-so-bad discount (so it was a bit cheaper than first early birds + all add-ons, by less than 20$ over 500$). This way they seemed to have offered a good deal to people, while they knew what will be in this level. For SOOBS they completely messed up their launch, they should not have tried to make this kind of pledge level so soon. Just wanted to chime in since I found about the SOOB project 1 day after it launched. At the time they had opened a 5th all-inclusive-tier at $425 which was $100 more than the limited early-bird tier. I balked at the price difference and basically decided not contribute anything to what looked like a cool project. If the price difference between the early bird and the regular price were $5 or so I definitely would have contributed but I’m sure there are others out there like me and just passed. We will launch next Monday. Can´t wait to share it with you guys! As a good example of early bird I’d like to mention ‘A study in Emerald’, where the limited level was a signed sticker. The level wasn’t cheaper, but I found it was a nice gesture even though I didn’t get one. First off, thanks for this blog! I’ve done 5 successful KS campaigns so far, and even I’m learning a lot from your posts! On this topic, I’m torn. The value to the campaign of an early backer IS higher to the campaign than a late backer. I feel they should be rewarded for not taking a wait and see approach. I like what Bones 2 did – earlier shipping for early backers. Also, if your campaign explodes, having later folks pay a few more dollars will help offset the increase in total package value. For my next campaign, I’m doing a “first 24 hour” level that saves a small amount, and a main level that has a high limit (1000). If that level caps out, the project will have more than $25 MSRP of free stretch goals added, so I’ll feel comfortable raising the next level by $2 or so. Luke–Thanks for your input. I’ve followed most of your Kickstarter campaigns, and my copy of Castle Dice proudly sits on my game shelves at home. Hi, I just started reading your blog and it has some interesting info there. For problems with early birds, you should look at Mars Attacks. It had an absurd number of EB levels, plus a complicated bonus system. On top of that, they had time related bonus rewards such as figures. Every weekend was like a drunken party, followed by a hangover at the beginning of the week. The time related incentives encouraged people to back the project to meet the deadline, but then after looking more closely at the details, many would back out. The comments section was full of depression and gloomy feelings every week because the totals would take three steps forwards, then 2 steps back. It got so bad that by the last week, people were leaving in droves and the project was losing money by the thousands. The main lesson I learned from that was to keep multiple KS accounts, so that when I run into a KS again that has EBs, and multiple tiers, I can back at the different levels, then as I learn more about the project and what stretch goals are coming I can later decide to change to a different tier without risk of losing benefits from an earlier tier. One can imagine that if many people were to do this, it would create chaos later in the campaign as people cancel their extra accounts. I think this is a large part of the craziness that was going on with mars attacks. I think EBs and any other time related rewards should be avoided like the plague. The only one I’ve seen that was reasonable was the Reaper2 EBs. This was done to make up for the muckup they had with shipping on their Reaper1 project. Chris: I like this description from your comment: “Every weekend was like a drunken party, followed by a hangover at the beginning of the week.” That’s a great analogy! Your solution is savvy, although I would recommend simply avoiding projects that use manipulative methods like that. If I intend to pledge a project, plus or minus 5 bucks doesn’t sway me one way or the other. I might do an “aww man!” but that’s about it. I care more about the free KS-only swag in most cases. Jamey, we are about to launch our first kickstarter project next weekend. I have been doing a lot of research and reading most of your lessons. Thank you for all of the information you have provided…it has been a great help! I have a question about Early Bird Pledge Levels. The problem we are faced with is how to handle this in our reward levels. We are trying to avoid jumbling up our kickstarter page by having twice as many reward levels (each of them early bird and not early bird). After a project is funded, do you get a list of backers in the order they pledged, so that we can determine which ones will get the early bird reward miniatures? Or is the only way to make this happen, by doubling up on reward levels? Any advice or ideas would be great. Hi Rachel, congrats on getting your Kickstarter ready to launch. However, if you’re set on doing them, yes, after the project you can download a list of all backers by reward level. You can seek further clarification (for add-ons and such) in the post-project backer survey. I should have also mentioned that we are wanting to do the early bird until you fund route. This seems to be the more preferred way to go, and I would love to avoid upsetting backers as much as I can. So with this in mind, we are wondering if we can get a list of backers in the order they pledged, but not broken down into different pledge levels, so that we can see the exact point that the funding goal was reached and which backers to send the early bird reward to. Is that available? If not, I guess we will have to add in early bird reward levels. Rachel: Yep, the spreadsheet you’ll get from Kickstarter will tell you the exact time that every pledge is placed. But typically what early-bird creators do is close the early-bird level–in your case, when you reach your funding goal, you’ll go to the Rewards tab and close that reward. You’ll then create a new reward (presumably at a higher price) for all future backers. Thus there will be a clear delineation between early-bird and non-early bird backers when you get your backer report spreadsheet. Just to add to Jamey’s comment – if you are doing an early-bird you don’t need to offer one for each pledge level. If you’re going to offer an early-bird discount/reward add it only for your base pledge level (1 copy of the game) and perhaps a “deluxe” level (all the bells and whistles). There’s no need to offer an early bird on every single pledge level when 95% of your backers will be interested in one of the above two levels. Well, here is what we are wanting to do. Our game provides many miniatures in the base game. We have a couple of Kickstarter exclusive miniatures to give away as early-bird specials. These miniatures are considered “extra” and would only replace miniatures provided in the game, giving a more unique look to a few pieces. Instead of a price decrease for an early bird pledge level, we are wanting to provide 4 of these miniatures free to each backer that pledges up until we reach our funding goal, regardless of pledge level. As noted in your lessons, we are adding these miniatures as reasonably priced add-ons, so a backer that discovers our project after it is funded will not feel like they “missed out” on the minis altogether. 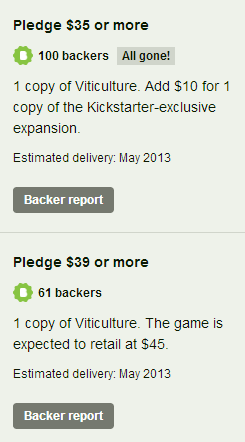 So if we were able to see when backers pledge, I don’t think we need new pledge levels. But I’m new to this, so please let me know anything I am missing. Rachel: Sure, you’ll be able to see when backers pledge. I double checked my spreadsheet, and it looks like even if a backer updates their pledge later in the project, the date on the spreadsheet remains the date of the original pledge. @Rachel: Ah – disregard my comment then. It was made more in reference to project owners offering “discount” early bird levels. I’ve seen projects with 8 base pledge levels and 8 more corresponding “early bird” levels which just adds a lot of clutter to the page without providing any real benefit. Okay great, it looks like we will be able to provide our early bird rewards without adding the clutter and confusion. Thank you both so much for your feedback and time! “There are a few problems with your rewards, however. Kickstarter doesn’t allow creators to change a reward level once the campaign has launched and a level has received any backers, so the 48-hour levels are a problem. You can limit a level to a certain number of backers, however. Martin: That’s a great question, and I don’t have a great answer. I was under the impression that a creator could close a reward level at any time while a project is live. After reading Kickstarter’s response to you a few times, I think they may have misunderstood your question. You certainly can’t change the text of a reward level after you launch a project and get at least 1 backer at that level. But I’m pretty sure that you can close a reward level at any time. So if you mention the 48-hour limit on the project page (not the reward level), enabling you to later edit that text, that might give you the flexibility you required to do this. I think you are right about the misunderstanding part, I am pretty sure that I have seen 48-hrs Early Birds before. I have replied them and hope they did misunderstand and that I can go on with it. I understand your policy of Early Birds and don’t want to do a fixed numbers of backers – early bird, but I think a 48hrs Early Bird will fit my Kickstarter fine, and it’s just going to be a $5 discount anyway. Cool! Please let us know what you learn. Your poll is flawed because it’s a blanket verdict on EBs. I think EBs are fine if the discount is not too steep and the pool is not too small. I detest the stepped EBs. There is simply no reason to ever have a stepped EB. In my experience stepped EBs are the ones which attract all the negative press. EBs are sales, and they do get the early momentum of the KS rolling. I expect you get asked this 100 times a day, so if you don’t have the bandwidth – totally cool. If you do, would you mind providing some thoughts in our Kickstarter page? I read this early bird blog, and confess I don’t think we’re following your advice that well. We are first time Kickstarters, so I’m hoping you’ll forgive us. :] I’m interested in any thoughts you may have on the pricing gap, since you recommended a $5 gap on your blog. I think our challenge here is that Coolest Cooler nailed it with their early bird, so it’s extremely tempting. Hi Chris, thanks for your question. I think you should reduce the gap to $10 at the very most. Also, I should point out something really important here: Don’t use mega-projects as examples to base your project on. The Coolest is awesome, but it’s also an anomaly. Instead, look at projects with similar products as Trobo to see what backers liked and didn’t like. Also, even if you want to compare your project to The Coolest, the numbers don’t add up. Your early bird offers a 33% discount off the core price level of $60. The Coolest, on the other hand, offers an 11% discount off the core price level. Hi Jamey, thank you for having a look and providing the assessment on our discount. AND thanks for the tips on pricing ending in 9 and staying focused. You’ve given me some food for thought; I still have a day to act before we launch. This is one of the points in the KS Lessons I struggle with most. I’m currently helping someone with their KS page and I included a single EB of $36 vs. $42 (limit 250). It just seems like a good booster. But then, I’ve never been bothered personally by EBs in my time backing games. I can’t argue with the evidence that it seems to turn a lot of people off. I just haven’t come up with a satisfactory alternative to it atm. I really like the Snowdonia method….wondering if that’s viable for us or not. Hi Ray, thanks for sharing. I think you already know what I’m going to say here. :) If your project is good, people don’t need early bird as a reason to back it, and you’ll be way better off in the long term. Just price the game at $39 and it will be just as appealing to backers. I like the art on the cards but I’m concerned about the main project image. I think it could be a lot stronger. I agree with you on the box cover (which is the main project image). We’re working to upgrade that before launch. If we ditch EB, do you think it’s important to have a tier between $1 and $39? I’ve never liked those random tiers that give things that aren’t the main project personally. Ray: Oh, it’s possible there are a lot more areas of concern, but I just gave it a quick glance to address your question above. If I find a kickstarter project has early bird pledges and I have missed them. I do not pledge at all. To date I have failed to pledge over 5 projects. As an alternative to EBs, would it make sense to set relatively low limits for the various reward levels as an incentive to encourage people to back them early, and then increase the limits gradually or in jumps over time? I have another reason for doing this — because in my planned campaign there are certain items that are more time-intensive to produce (so I can only make so many) and these components are shared by various reward levels. Changing the limits over time will allow me to dynamically re-balance things so that if one reward gets fewer subscribers than another, I can raise the limits on the more popular reward and in so doing, allocate more of the limited items to that reward. Does that make sense? James: That does make sense, but I think the perception of anyone who arrives “late” will be that they missed out simply because they didn’t hear about the project within the first week of the campaign. However, backers respond well to reward levels that are limited for a reason. Like, if you can only make 100 of a special item, offer a reward level from day 1 that features that item at a higher price than the normal reward level. Thank you Jamey. I think I may do it where I limit each of the various rewards that include the item to say 100, and keep a few hundred more of the items in abeyance to apply to whichever few rewards are approaching their 100 limit first, and increase their limits accordingly until I reach my production limit. I took your advice on getting rid of EB rewards. I never liked them myself as they do make people feel like they lost out. However, I am wondering what your opinion is on having EB items at the same price as everything else, but with the difference being that the EB backers get their rewards earlier than the others (first to ship out)? With the limits approach I’m not seeing how people who arrive “late” will feel like they missed out. There are no EBs or time limits — just quantity limits as are normal with any campaign. The difference is that I will have flexibility to increase some of these limits if demand warrants it. This is a bit off-topic but I am wondering if there is a better approach to how I plan to break out my rewards. I have a core product which can come in one of two materials, and can be scaled up with 4 other accessories. In order to provide backers with flexibility I currently have about 30 combinations (reward levels) that they can choose from. Can I alternatively reduce the rewards to just a few and then give backers the option to add to their pledge according to which accessories they want added? Even if I can do this, could this approach end up being more complicated? The selected combination affects weight and shipping costs, and the two materials also have different costs and weights too. If I built the shipping costs into the product price, that won’t make much sense as international backers have to pay a lot more for shipping than domestic backers. Also, I wonder if tracking the pledges will also be more difficult. Having not run a campaign before, this isn’t clear. 30 combinations is a lot of combinations. I’d recommend simplifying it down to 3 pre-selected combinations with a shipping subsidy built into each one based on weight so that you don’t have to change shipping fees per country per reward. You can then offer a max of 5 add-ons (that’s an arbitrary number I’m recommending to keep it simple). Thank you Jamey. I must confess that the campaign is not for a game, but I found your site and much of your advice is universal in its application to any kind of campaign! I like very much EB. The main question I see is this: has a backer at the beginning of the Kickstarter campaign the same value as one when the project is already funded? As one at the end of the campaign when all reward levels are unlocked? Of course not. If the early adopters don´t believe in the project, it will not succeed, regardless of the rest of possible backers. If you agree to that, it is a matter of deciding if those people deserve to be rewarded. In my view yes since they make the project viable. I don´t see it as a gimmick, or something like that. Just rewarding what I think it is due. I see a lot of EB on events. It is exact the same logic. The organizer has to book space (which is usually pricey), book guests flights, and other costs such as marketing. Usually if at lease X amount of people is not enrolled by Y date, the organizer cancels the event. So, in order to make it possible, he/she uses EB strategy rewarding those initial participants who makes the event possible. Makes sense, right? Jose: I like your analogy, though I think it supports the idea of the entire Kickstarter campaign as the “early bird.” The “event” in this case is the very existence of the product, which is defined by the timeframe of the Kickstarter campaign. Yes, the people who show up for the campaign should be rewarded with a special deal, as they’re the ones who bring the project to life. That’s ALL backers, not just the people who happened to hear about it in the first 48 hours. In the end, it’s your decision. As you can see by the poll, the majority of people do not like early birds, by a significant margin. It’s up to you as the creator to use data like that as you wish.